This collar sewing tutorial will help you when sewing blouses, shirts and shirt dresses. This is basic Style Arc sewing tutorial covers how to sew a collar to a collar stand and a collar stand to a neckline. 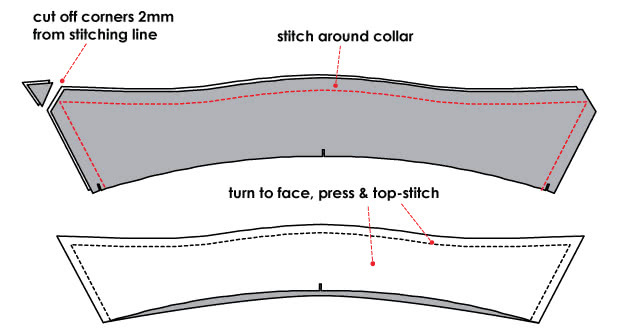 Follow the steps below to make the perfect collar! 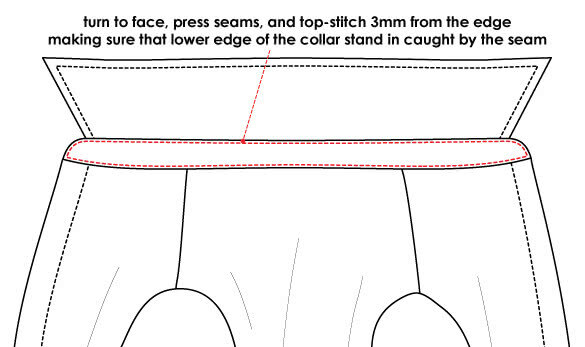 Lay collar pieces face-to-face and stitch around the outer edge of collars. Trim corners 2 mm from stitching line to reduce thickness. Turn to face (bag out), press and top-stitch. Press lower edge of outer collar stand upwards to secure seam allowance. Place collar between collar stands and stitch together. Turn to face and press neatly. Pin lower edge of collar stand to neckline, matching notches. Then stitch collar to neckline. Turn to face, tuck seam allowances into collar stand and press. Then top-stitch around collar stand 3 mm from the edge, making sure that lower folded edge of the collar stand is caught in the seam. For a clean /classic look, sink-stitch (stitch in the ditch) along the neckline seam to connect the lower collar stand.